The Milton Substance Abuse Prevention Coalition brings together a variety of community stakeholders, professionals, students, and town leaders to work collaboratively on reducing, preventing, and addressing substance abuse and related mental health challenges in our Town of Milton, primarily amongst youth. We recognize that our community is not immune from these problems, and we are motivated to face them together. We are also committed to making it easier for those afflicted with these disorders to get information about where to find help, and providing opportunities for them to contribute to and inform our work. The coalition is sponsored by the Milton Public Health Department. In addition, the Coalition deeply appreciates the support of our Funders. Representatives from Milton High School, Milton Police, BID-Milton Hospital, Milton Health Department and Milton’s Youth Task Force talk about changes that have been made since the release of the findings from our first community health assessment. Question and answer time to follow. Two Big Announcements from MSAPC! The Milton Police Department, in partnership with the Milton Substance Abuse Prevention Coalition, is launching a new community outreach program by visiting the homes of Milton residents who have recently suffered from a nonfatal overdose of drugs or alcohol. The goal is to provide them and their family members with resources and, ideally, a direct referral to support and treatment. The Milton Cares Post Overdose Response Team (Milton Cares PORT) will begin visiting homes on September 5, 2018. Besides providing access to information and treatment, Narcan and training on its administration will be provided to the family or loved ones of those Milton residents most at risk for a fatal overdose. The intent is NOT to arrest; it is to recognize that addiction is a family disease that can benefit by support, information and treatment. "Milton Cares!" Partners at the Sept. 5 press conference. The Milton Public Health Department was notified at the beginning of September, by the federal Substance Abuse and Mental Health Services Administration, that the Milton Substance Abuse Prevention Coalition will be awarded $125,000 per year for the next five years to focus on youth substance abuse prevention in the town. The Drug Free Communities (DFC) grant application was submitted by the coalition in March, and the funding will officially begin on September 30th. The focus of the application will be to strengthen community partnerships so that town leaders, youth and residents can work effectively together on decreasing the high rates of youth underage drinking, marijuana use, and vaping in Milton. MSAPC Core Stakeholders Group at the Sept. 5 press conference during which the 5-year DFC grant was announced. If you think that someone has overdosed on alcohol or drugs, call 911 immediately and state that you believe someone has overdosed and provide a clear address and location. Rapid response is essential for preventing potential permanent brain injury or death. Follow this link for specific information. The Milton Coalition runs on volunteers and is always seeking new members. We don’t care what skills or experience you bring. Everyone is welcome. Everyone is needed. Find your niche here. We encourage you to sign up for the Milton Coalition's electronic newsletter in order to stay up to date with events, activities, and opportunities. Click this link to subscribe. MSAPC has launched a Facebook Page! Please “follow” and “like” us and spread the word with your neighbors to learn about how we can keep Milton safe from alcohol and drug abuse. This new resource has new information for youth, parents and schools about the dangers of vaping. Please get informed. So many kids in Milton are vaping these days; a new generation of kids are getting hooked on vapes instead of cigarettes. A new free and confidential mental health and substance use referral call line is now available to Milton residents. It is called Interface Referral Service. By calling 888-244-6843 Monday through Fridays from 9am-5pm, a trained counselor will help to match you with a professional psychologist in our area who specializes in the mental health or behavioral health problem you or a loved one is experiencing. Watch a short video on Interface here. Milton Public Library's Keyes Room was at near capacity for the May meeting. Four Milton High students gave personal insights and fielded audience questions. Over 70 Milton leaders and residents attended a first-ever youth led meeting on behalf of MSAPC at Milton Public Library on May 17, 2018. The captivated audience of adults heard four Milton High School students share their perceptions of why anxiety and depression are so prevalent amongst teens, how certain groups like immigrants, LBGTQ and female students are at higher risk, and how the community and schools can better support teens as they cope with behavioral health challenges. Student Arielle Solomon was the keynote speaker. She shared information that she learned from attending a youth leadership conference entitled, How Not to Keep a Secret. Students and adults explored together some of the issues raised at the meeting and Mr. Jette, Principal of Milton High School, assured students that their remarks were heard and respected, and will certainly be shared with the school district. More photos from the May 2018 meeting may be viewed in our 2018 Scrapbook page. 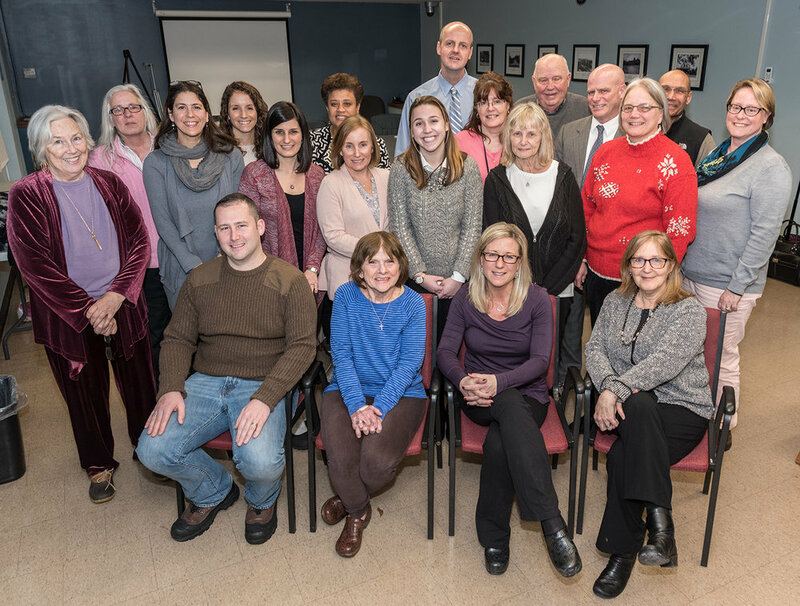 MSAPC’s Core Stakeholder Group poses with Mrs. Dianne Mulcahy, Tom Connolly and Denise Queally , who are family and friends of Mike Mulcahy who passed away after a heroic battle with addiction. The Mulcahy family sponsored “Mike’s 5K to Crush Substance Abuse”, and presented a check to our coalition in the amount of $27,500. "Team MSAPC" was a colorful presence at the inaugural Mike's 5K To Crush Substance Abuse, which took place on October 21. Dr. Ruth Potee, expert physician who specializes in adolescent substance use, informs parents that addiction is an adolescent brain disease that begins in the early years. The job of parents and the community is to delay drug and alcohol use as long as possible to prevent addiction later on. Part of the PARENT series on February 8th at Milton High School. Milton Access TV captured Dr. Potee's presentation. You may view it here. Together with with our regional partner the Quincy Substance Abuse Prevention Coalition, MSAPC is engaged in a campaign to let parents know that it is potentially dangerous and definitely illegal to serve alcohol to minors. This sign is appearing on buses and in newspaper ads across Milton. Milton High Students watch Drug Story Theatre, with young people telling their real life stories of drug addiction and recovery. The Milton Substance Abuse Prevention Coalition was bestowed a Community Hero Award on September 28, 2016 at the South Shore Hospital's annual Youth Substance Use Conference. The award acknowledged our efforts to build awareness and action to address youth alcohol and drug use in our town. Over 300 people were in attendance, many from Milton, including students from MHS's SADD group with their advisors Karen Hughes and Robin Lee. The Coalition's 2015-2016 Community Assessment reports (part A - "quantitative" and part B - "qualitative") are available on this site now, along with an link to a video and slides from the February 24 meeting at which the Quantitative report was presented. Find the reports and the slides on this page. Weather forced the 23rd annual CelebrateMilton festival indoors on October 2nd. The event was well attended though, in spite of the dreary weather outside. MSAPC had a visible and vibrant presence. As befits a community organization, conversation and collaboration are key ingredients to a meeting. 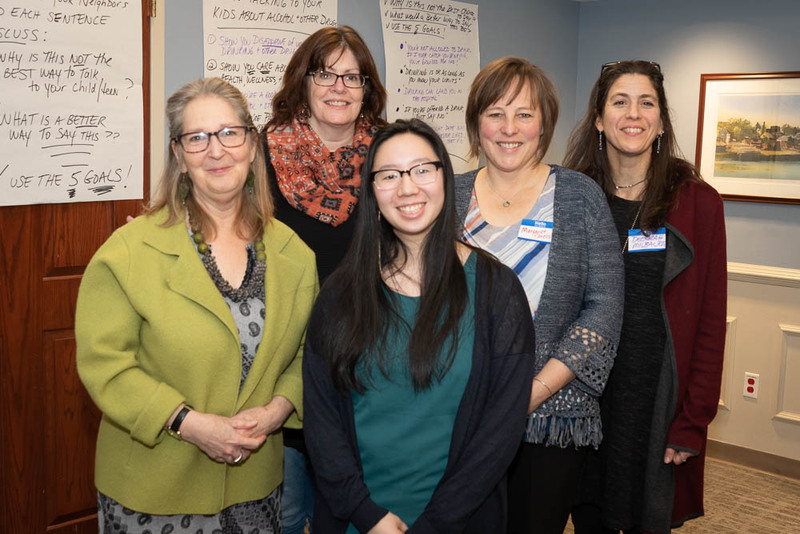 Following the Community Assessment Report at the February 24 meeting, meeting attendees broke out into small sessions to consider the "Why" behind the data. Caroline Kinsella leads one of the breakout discussions at the February 24 meeting.